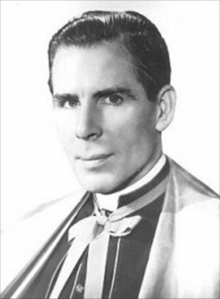 Destined to become the most famous American Catholic of the 20th century, Archbishop Fulton J. Sheen (1895-1979) was born on a farm near El Paso, Illinois. His adult height was 5’7”. Throughout life he never weighed more than 140 pounds in spite of a chronic addiction to chocolates and ice cream. Farm neighbors who had seen him in his teen years struggle mightily to turn a team of plough horses said he would never make a farmer. In later years Sheen admitted that studying for the priesthood may well have been motivated in part by his terror of trudging behind a plough for the rest of his life. Everyone noticed that he excelled in his studies and made a superb player on the high school and college debating teams. Upon earning his baccalaureate, he was offered a full scholarship to study for a PhD. This opportunity he was persuaded by a priest friend to decline in favor of studying for the priesthood. As is often the case, Sheen’s mother was the main influence behind his call to the priesthood. Early in his life she had taught him the moral imperative: he had stolen a 10-cent pot of geraniums from a grocer; she made him return the pot with an apology and fifty cents from his piggy bank. Perhaps at this time he also learned his later opposition to war, having been required during his boyhood, as he later reminisced, to wring the necks of about 22,413 chickens. While in the seminary Sheen had ulcers, and a section of his intestines was removed. Thereafter he required little food on his plate, and cleverly acquired the habit he called “rolling the carrot,” using a fork to move the food about his plate in such a way as to make it seem he had eaten a fair portion. During his seminary years Sheen mastered the writings of Thomas Aquinas, very much in vogue at the time. After ordination he continued studies in Rome, where he encountered a voice instructor who gave him lessons that would prove enormously useful as a preacher. In London he met and favorably impressed G. K. Chesterton, the most popular Catholic writer of his day. Chesterton would later write the introduction to Sheen’s first book, God and Intelligence. Sheen little realized that he himself would someday be referred to as the American Chesterton for his way of rendering unusual insights with brevity and punch. Eventually Sheen’s bishop sent him to teach at the Catholic University of America in Washington, D.C. Very popular with the students at CU, Sheen taught there for well over 20 years; but he had to endure the petty distractions of faculty politics and the envy of other professors irritated by the astonishing number of books he published and the energy he devoted to the Catholic Radio Hour from 1930 to 1950. It is not possible to go into depth here about the books and the radio preaching, except to say that during this period Sheen got for himself a reputation as the most influential religious thinker and speaker of that period. He lavished a great deal of his energy opposing the growth of the Marxist influence in America and agreed with the popes of that period that the long range influence of Communism would be far more dangerous to the Church and the whole world than was the threat of the Nazi party in Germany. Sheen, Cardinal Spellman of New York and other American religious leaders were appalled when they discovered the deals FDR and Truman had made to leave Poland, East Germany, and other satellite countries under the heel of Stalin’s atheistic and corrupt regime. Sheen, moreover, was among the first churchmen to condemn the dropping of atomic bombs at Hiroshima and Nagasaki. Referring to the corollary of Christ’s command in the Sermon on the Mount (Do not do unto others what you would not have them do unto you”), Sheen asked how Americans would have felt if Hitler had dropped such bombs on American cities. In 1934 Sheen had been made a Monsignor and began to wear his trademark touch of purple and flowing cape on every public occasion. Sheen’s theatrical talents were observed and remembered by many. Sometimes at small gatherings he would mime Charlie Chaplin’s tramp character, including walk and gestures. Perhaps Sheen’s personal trait that stood out most was his hypnotic stare. He sometimes appeared to people to be staring right through them if the conversation was interesting. But if for one second he thought you didn’t know what you were talking about, you knew from the glaze over his eyes that you had been judged. During the 30s and 40s Sheen became famous for converting people from every walk of life. He was convinced that people were attracted to the Church because they were tired of the world’s excuses for all the right and wrong that is in the world. But most of all they were convinced that the Church was better than any other path to the forgiveness of their sins. When working with converts he chose never to attack the religion from which they were coming, and he advised others to do likewise. The actress Loretta Young, industrialist Henry Ford II, and playwright Clare Boothe Luce were just three of his more famous converts. One day Monsignor Sheen was visiting Jo Mielziner, a Hollywood personality, for the purpose of giving him instructions in the teachings of the Church. Greeting Sheen at the door, Mielziner explained that the actor Humphrey Bogart was in the living room, that he had just invited the actor to sit in on the lesson, and that Bogart, living up to his wise-guy persona, answered that he probably knew more about the Catholic Church than any priest knew. Introduced to Bogart, the actor innocently asked Bishop Sheen if his father had also been a priest. Sheen’s television series ended in 1957, after which followed a flurry of book publications, including his critically acclaimed Life of Christ (1958) and his autobiography, Treasure in Clay (1980). My own favorite is an earlier volume, Peace of Soul (1949). This is a profound philosophical study of the importance of the sacrament of reconciliation as it relates to spiritual conversion and discovering God in our lives. The chapters titled “Examination of Conscience,” “The Psychology of Conversion,” and “Is God Hard to Find?” are especially deep and rewarding. In “Is God Hard to Find?” Sheen replies that God can certainly be found; in fact, the search for God is so natural that sooner or later, barring self-imposed or societal obstructions, God should be found. After all, man is the only animal who is not content with satisfying his immediate needs; he constantly craves answers to questions about his own destiny and the destiny of the universe that no other animal could think to ask. In other words, man is the only metaphysician and theologian in the world, so there is no natural impediment to his search for God. Reason itself is on his side because reason tells him that there must be an invisible Power and Design behind all the forces of nature. This instinct is so universal that religion exists everywhere in the world; even if, at times, some religious impulses are immature or misdirected or radically confused. In the chapter “Examination of Conscience” Sheen invites the reader to begin the climb on the ladder to perfection; not an essentially agreeable climb since it requires once again that we submerge our egos in the great I Am. That is, it requires that we see ourselves in all our ugliness that we may begin to make ourselves more beautiful in the sight of the Lord. Sheen sees St. Augustine in his Confessions as the supreme exemplar of he who is not afraid to examine his own soul. Augustine was centuries ahead of Freud. Sheen admits that the psychological school of psychoanalysis has much to recommend itself in that it promotes our search into ourselves and the recognition of the truth about those parts of ourselves that are causing us to be sick. Where psychoanalysis goes wrong, however, is that it denies the existence of sin and the need not only for recognition of such, but also for God’s forgiveness of our sins. That is why in the long run the priest’s confessional is so much more healing than the psychiatrist’s couch. Sheen was adamant that there is in us a certain egotistic predisposition to regard the admission of guilt as a character defect, and that the only sin is to admit the existence of sin. Since people like to put their ego above all else, they cannot admit the existence of “an outside Power from whom the saving experience will come…. Therefore a necessary prelude to conversion is a spirit become docile, teachable, and humble. For if we think we know it all, not even God can teach us.” Here Sheen echoes the words of Jesus: “Amen, I say to you, unless you be converted, and become as little children, you shall not enter the kingdom of Heaven. Whosoever therefore shall humble himself as this little child, he is the greater in the kingdom of heaven” (Matt. 18:3-4). Carl Sundell is Professor Emeritus of English and Humanities at Quinsigamond Community College in Worcester, Massachusetts. He currently resides in Lubbock, Texas. He has authored several books and has contributed articles to New Oxford Review and Catholic Insight. He is currently developing a book for students of Catholic apologetics.